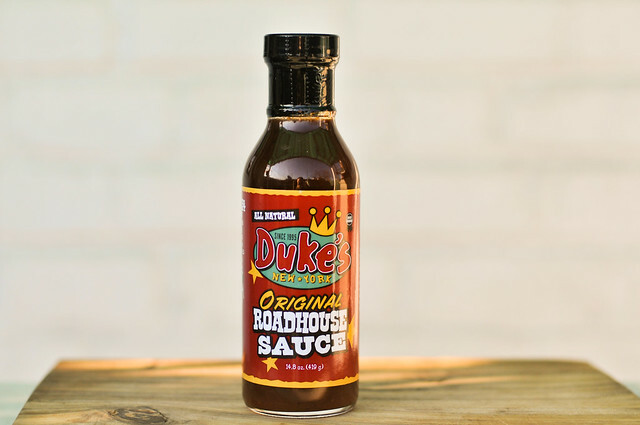 Duke's Original Roadhouse Sauce comes from an era before the glory days of NYC barbecue, and it's middle-of-the-road flavor is clear proof of that. I picked up this sauce at a Whole Foods in Union Square, not even realizing its namesake bar/restaurant was just a few blocks away. Admittedly, I've never heard of Duke's Roadhouse before trying this sauce, but they have two locations in NYC. First opening in 1995, they seem to be type of sports bar that boasts of the comforting American cliches and excess that can sometimes be hard to find in the city—lots of TVs, huge portions, "fall-off-the-bone ribs," and more. 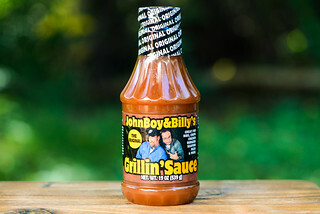 Beyond the restaurants, they offer two sauces available online and in select store, coming in Original and Hot N Spicy varieties. Vinegar tartness is the first trait you get on a quick smell. It's strong, but not so much that you can't make out the distinct Worcestershire and onion notes that are close behind. There's a deep tomato as well, but not a ketchup-y sweet type. Finally, the almost always pungent liquid smoke rears its head in aroma department at the very end. The smoothness of this maroon, opaque sauce it broken up by chunks of onion and possibly garlic. While those elements are visible, there are not many spices to be seen. The sauce comes in just on the thinner side of medium, and has a watery drip off a suspended spoon. 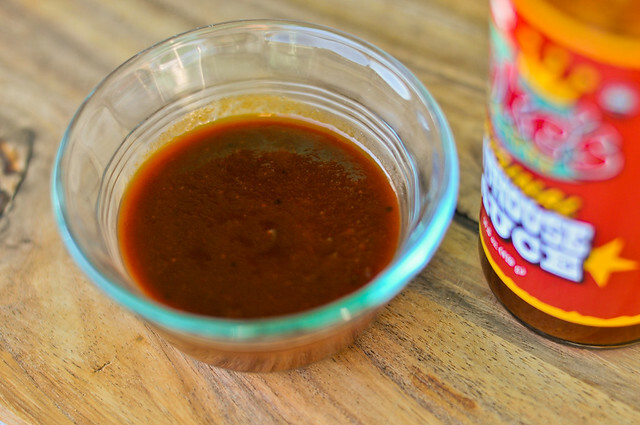 The sauce starts off with a nice, smooth sweetness that melds great with the tomato flavor. Vinegar then quickly takes over, while the Worcestershire and onion try to make themselves known with limited success. Then comes a very mild spice, followed by the liquid smoke, with leaves a funny aftertaste. The crunchy chunks add an interesting texture, but seem to do nothing for the flavor. 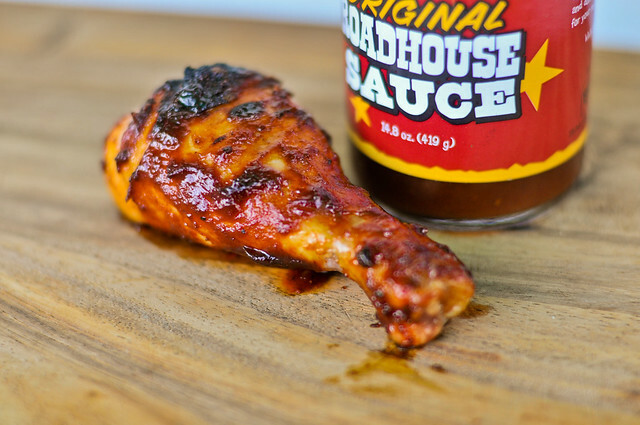 At first this sauce was looking good on the grill, baking in over indirect heat, but then once the chicken moved to direct heat, the burning began. Quickly ending the cook before the entire leg burned, I was able to get a good sense of what this sauce was like after being grilled—overly sweet. 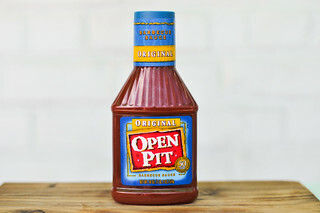 The sugars that were tame out of the jar came out in full force on the grill, giving a flavor of a sweetened ketchup. The other elements that define this as a barbecue sauce were diminished, leaving me with mostly sticky sugar fingers to lick after the meat was gone. This is a good example of a really middle of the road barbecue sauce—there's nothing wowing, but also nothing horribly wrong. 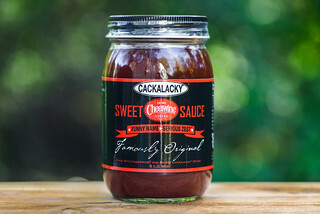 The funky liquid smoked after taste would give me pause using this as a dip, although that would certainly be less noticeable after being applied to meat rather than eaten straight off a spoon as I tested it. On the grill, you'd probably want to steer clear of using over direct heat, preferably letting the sauce develop its extra sweetness over a longer indirect cook.